This post explores Allegheny County and Pennsylvania through census data. 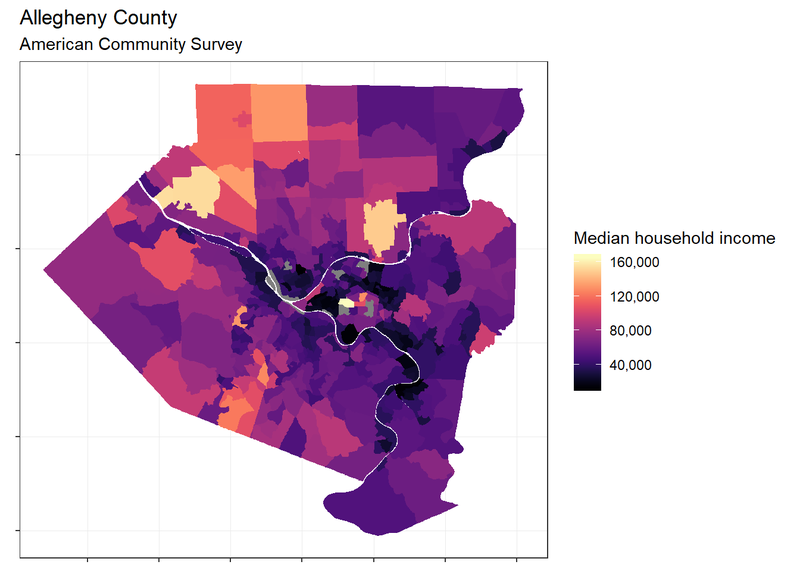 I use the tidycensus and sf packages to collect data from the census API and draw maps with the data. tidycensus provides a wrapper for the U.S. Census API. You can request a wide variety of data, from economic measures to information about demography. The API also includes data about geographic regions. This code creates a dataframe of some of the variables available through the census API. This code requests information about the median income of census tracts in Allegheny County. The “geography” argument sets the level of geographic granularity. This code maps the data onto the census tracts. The st_erase function makes the rivers show up on the map. This code requests information about the ethnicities within each census tract. Then, it calculates the percentage of the entire population of a tract that each ethnicity makes up. This code maps that data. The facet_wrap function creates a map for each ethnicity. You can also request data for an entire state. This code requests the median income for each census tract in Pennsylvania. This code requests ethnicity data for each tract in Pennsylvania.